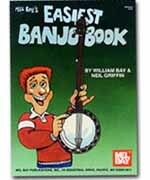 A lively collection of songs for strumming and easy solos for 5-string banjo. Solos are in tablature with both melody and solo parts and feature three-finger picking technique. Slide, hammer, and pull-off techniques are taught. A basic chart of banjo chords is also included.